Astronomie - January Full Moons 2018: See the Full Wolf Moon and a Blue Moon, Too! 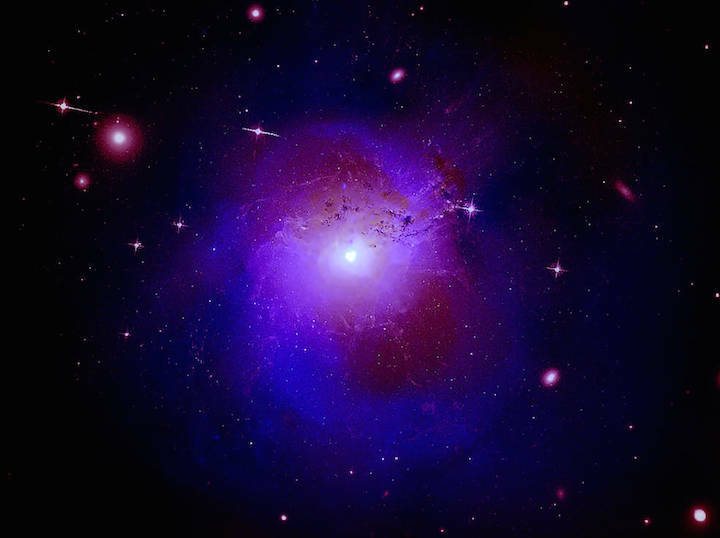 Composite image of the Perseus galaxy cluster using data from NASA’s Chandra X-ray Observatory, ESA’s XMM-Newton and Hitomi, a Japanese-led X-ray telescope. An innovative interpretation of X-ray data from a cluster of galaxies could help scientists fulfill a quest they have been on for decades: determining the nature of dark matter. The finding involves a new explanation for a set of results made with NASA’s Chandra X-ray Observatory, ESA’s XMM-Newton and Hitomi, a Japanese-led X-ray telescope. If confirmed with future observations, this may represent a major step forward in understanding the nature of the mysterious, invisible substance that makes up about 85% of matter in the universe. The story of this work started in 2014 when a team of astronomers led by Esra Bulbul (Harvard-Smithsonian Center for Astrophysics in Cambridge, Mass.) found a spike of intensity at a very specific energy in Chandra and XMM-Newton observations of the hot gas in the Perseus galaxy cluster. This spike, or emission line, is at an energy of 3.5 kiloelectron volts (keV). The intensity of the 3.5 keV emission line is very difficult if not impossible to explain in terms of previously observed or predicted features from astronomical objects, and therefore a dark matter origin was suggested. Bulbul and colleagues also reported the existence of the 3.5 keV line in a study of 73 other galaxy clusters using XMM-Newton. The plot of this dark matter tale thickened when only a week after Bulbul’s team submitted their paper a different group, led by Alexey Boyarsky of Leiden University in the Netherlands, reported evidence for an emission line at 3.5 keV in XMM-Newton observations of the galaxy M31 and the outskirts of the Perseus cluster, confirming the Bulbul et al. result. However, these two results were controversial, with other astronomers later detecting the 3.5 keV line when observing other objects, and some failing to detect it. The debate seemed to be resolved in 2016 when Hitomi especially designed to observe detailed features such as line emission in the X-ray spectra of cosmic sources, failed to detect the 3.5 keV line in the Perseus cluster. In order to test whether this difference mattered, the Oxford team re-analyzed Chandra data from close to the black hole at the center of the Perseus cluster taken in 2009. They found something surprising: evidence for a deficit rather than a surplus of X-rays at 3.5 keV. This suggests that something in Perseus is absorbing X-rays at this exact energy. When the researchers simulated the Hitomi spectrum by adding this absorption line to the hot gas’ emission line seen with Chandra and XMM-Newton, they found no evidence in the summed spectrum for either absorption or emission of X-rays at 3.5 keV, consistent with the Hitomi observations. The challenge is to explain this behavior: detecting absorption of X-ray light when observing the black hole and emission of X-ray light at the same energy when looking at the hot gas at larger angles away from the black hole. In fact, such behavior is well known to astronomers who study stars and clouds of gas with optical telescopes. Light from a star surrounded by a cloud of gas often shows absorption lines produced when starlight of a specific energy is absorbed by atoms in the gas cloud. The absorption kicks the atoms from a low to a high energy state. The atom quickly drops back to the low energy state with the emission of light of a specific energy, but the light is re-emitted in all directions, producing a net loss of light at the specific energy – an absorption line – in the observed spectrum of the star. In contrast, an observation of a cloud in a direction away from the star would detect only the re-emitted, or fluorescent light at a specific energy, which would show up as an emission line. The Oxford team suggests in their report that dark matter particles may be like atoms in having two energy states separated by 3.5 keV. If so, it could be possible to observe an absorption line at 3.5 keV when observing at angles close to the direction of the black hole, and an emission line when looking at the cluster hot gas at large angles away from the black hole. “This is not a simple picture to paint, but it’s possible that we’ve found a way to both explain the unusual X-ray signals coming from Perseus and uncover a hint about what dark matter actually is,” said co-author Nicholas Jennings, also of Oxford. To write the next chapter of this story, astronomers will need further observations of the Perseus cluster and others like it. For example, more data is needed to confirm the reality of the dip and to exclude a more mundane possibility, namely that we have a combination of an unexpected instrumental effect and a statistically unlikely dip in X-rays at an energy of 3.5 keV. Chandra, XMM-Newton and future X-ray missions will continue to observe clusters to address the dark matter mystery. A paper describing these results was published in Physical Review D on December 19, 2017 and a preprint is available online. The other co-authors of the paper are Sven Krippendorf and Markus Rummel, both from Oxford. NASA's Marshall Space Flight Center in Huntsville, Alabama, manages the Chandra program for NASA's Science Mission Directorate in Washington. The Smithsonian Astrophysical Observatory in Cambridge, Massachusetts, controls Chandra's science and flight operations.